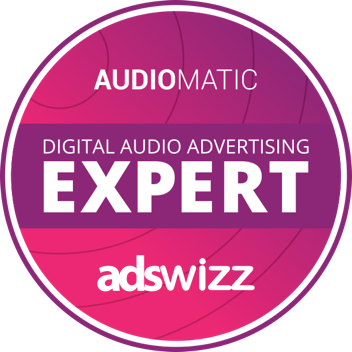 The Digital Audio Advertising EXPERT- AUDIOMATIC is a unique, first of its kind accreditation for advertising agencies & programmatic trading desks. It is granted to advanced users of AdsWizz’ audio-centric Demand Side Platform (DSP). The certification represents the validation of one’s mastery of using AUDIOMATIC. It requires in-depth knowledge of executing audio-first advertising campaign planning & trafficking, using audio first ad formats, advanced targeting, monitoring campaign results.